New age gifting with wide range of induction cookware. 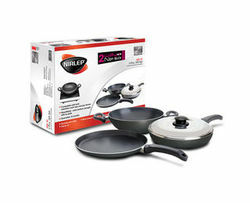 The set contains unique combination of :Flat Griddle of 250 MM, Fry Pan of 240 MM, Kadhai of 240 MM, with Common Glass lid. These high-performance, induction compatible Non-stick range is sure to be the perfect gifting delight! Non Stick Cook Ware offered is the best available cookware choice available in the market in the non stick kitchen utensil section. Coming in superior crafted finish, these stainless steel metals based cookware come in layer bonded construction and other advanced functional changes that make it finest range of cookware available to date. 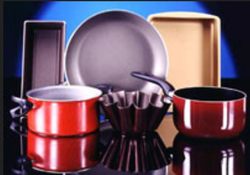 We are occupied with satisfying the assorted prerequisites of customers by offering an ideal quality Non Stick Cookware. At our generation unit, if cookware is made utilizing quality affirmed crude material and forefront systems under the stern perception of gifted experts. If you want to cook with less or no oil or butter, non stick cookware is the cookware to use. Foods which tend to stick to the pan while cooking are best cooked in nonstick. Also, clean-up is so easy.